The following narrative was coordinated by Denis Woodhams,. A NAM(AE) on 893 Squadron from August 1960 till July 1962, Yeovilton, Ark Royal and Centaur. Then in October 1964 as a LAM(AE) and plane captain on 892 Squadron. In 1965 he qualified as aircrew SAR Diver and served on SAR Flights at RNAS Brawdy/HMS Victorious (814 Sqn) and left the Service in January 1968. On the 23rd January 1967 HMS Hermes was on Commission in the Mediterranean steaming towards Malta. 892 Squadron was conducting flying exercises. A Sea Vixen of 892 squadron was launched and the Observer ejected off the catapult. The pilot was unable to eject and was with the aircraft on impact with the sea. (Accident ID 41). The Planeguard immediately went to the rescue. The Planeguard helicopter was hit by the ship and crashed along with the Sea Vixen. The pilot of the Sea Vixen was lost and so was the Heroic Pilot of the Planeguard helicopter . The Observer of the Sea Vixen was saved. There were many injuries among the helicoptor crew that survived. 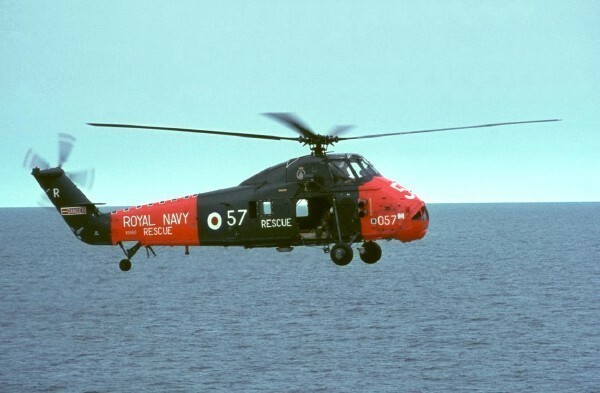 The Search and Rescue (SAR) planeguard involved was a Wessex 1 XS883 crewed by Lt John Betterton (Pilot), NA Dennis Hodgson (Crewman) and NA Jamie Bauld (SAR Diver). They were also carrying a LA Phot Chadwick in the left front seat who was there for an air experience ride. An anti-submarine sonar helicopter on a mission nearby flown by Lt Harding and NA Crewman Dave Wrigglesworth also went in to assist at the tragic events that ensued. The following is a personal testimony from a crew member involved in this rescue. Dave Wrigglesworth was crewman in a sonar Wessex who picked up NA Dennis Hodgson (Crewman) and LA Phot Chadwick. submited June 2008. The sea vixen crew Lt Smith (Pilot) and Lt Love (Observer) both ejected off the launch and the planeguard was over the pilot when the ship hit it. NA Jamie Bauld (SAR Diver) and NA Dennis Hodgson (Crewman) were thrown clear, Dennis suffering broken ribs and pelvis. The helicopter went right under the ship and came up astern upside down with the pilot still in his seat. Jamie went to the observer, got him into his dinghy and they were both picked up by another helicopter. I know that Jamie Bauld survived having got the Sea Vixen observer (Lt Love) into his dinghy and they were picked up by another Wessex quickly on the scene. This Wessex was crewed by NA Crewman Ken Arden and a diver who recovered Lt Betterton who sadly did not survive. We don't at present have the name of pilot or diver. I understand Lt Smith's body was never found." The following is a personal testimony from then NA Crewman Dennis Hodgson who was badly injured in the collision. submitted June 2008. I found a request from Denis Woodhams about details of the Wessex that crashed on 23/01/1967. The pilot was Lt John Betterton who died, crewmen Dennis Hodgson (me) who survived with lots of injuries . Jamie Bauld was the diver, who rescued the observer Lt John Love and there was a phot man in the left front seat called Chadwick, he also survived. I can remember to this day Robin Smith waving to us on the catapult. I was evacuated to the Naval Hospital in Gibraltar." This tragic event described serves as testimony to the bravery of Search and Rescue (SAR) crews that constantly flew alongside an Aircraft Carrier at flying stations by day and night ready to rescue downed Naval Airmen. They flew at all times within a precarious flight envelope called "Deadman's Curve", which meant that in the event of an engine failure they would hit the sea like a brick unable to make a controlled ditching. The SAR divers were trained to jump from a great height from the SAR helicopter with specialist mini breathing equipment in order to effect a quick rescue and help the airman escape as the aircraft sank. We remember here the names of our lost Airmen. 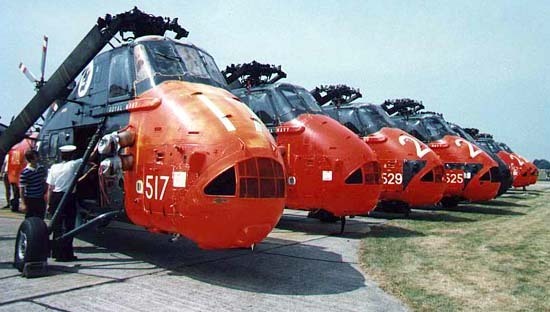 Wessex Mk 1 Helos on display at RNAS Lee on Solent 1983.